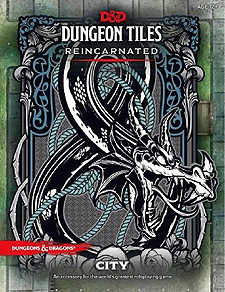 Add excitement to your tabletop Dungeons & Dragons game with these full-colour dungeon tiles. Easy to set up and infinitely expandable, these dungeon tiles allow you to create the adventures you want to play. This box contains 16 durable, double-sided tiles sheets, featuring city streets, buildings, sewers and other terrain elements that Dungeon Masters can use to stage exciting encounters. Use these tiles to make fantastic city maps to enhance your tabletop roleplaying game experience. For use with the Dungeons & Dragons Roleplaying Game.